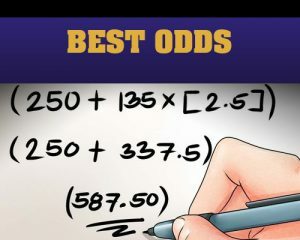 Some of this information may be obvious for you but for some other readers all this is useful as we know that novice sports bettors consider understanding how odds work to be one of the most confusing sets of numbers they have ever dealt with. But we can’t stress enough the importance of knowing how the odds work if you want to make your betting experience a profitable and enjoyable one. It’s critically important because it allows you understand how likely an event is to happen, and potentially what your winnings will be. Here we will oversee some of the basic styles of betting odds, reading the different formats and how to use them in your favor. But just like with everything in life the only way to really learn how to play with the odds is by adapting the appropriate information and utilizing it first hand and in RegalPoker.com you will certainly find the best odds. So here’s how sports betting normally works, you make your pick for Sunday or Monday night, but before you do place your bets, you may want to take a second look at the odds you’re getting because lines may look good but it is good to ask yourself one question. Is it the best line you can possibly get? In such case, that you were able to find better odds elsewhere, what would it really mean? Let’s put it in simple words, if you end up winning the bet, you could be in for a better payout. And if you lose, there could be a chance that you could save a few bucks if you got a more favorable line. Betting odds allow you to calculate how much money you will win if you place a bet. The exercise of sports betting is plain, you must predict the outcome of a certain event, if your prediction is correct you win some money, for any given event there is a certain amount of outcomes. Tossing a coin is an example, another example, more complex if you will is rolling a dice, when rolling a dice there are six possible outcomes, any prediction means a 16.67% chance that you will hit. Betting odds present how likely the event is to happen. The process is more complicated than many people make it out to be. First of all, there are examples of sports books that are explicitly based upon the public’s actions… one school of thoughts is for the houses to expertly determine the “true” odds, and set the line accordingly. Another school of thought is that the house can manipulate the line so as to receive balanced action on each side and guarantee profits. However, legitimate betting houses handle thousands and thousands of events every year, so they don’t have to be overly concerned with guaranteeing a smaller profit if a larger profit can be had in expectation. As handled by sports books, this is not purely an accounting problem.